We invite you to celebrate the culmination of Women’s History Month with an event that connects ladies seeking to write their visions while having a fun and fabulous time. 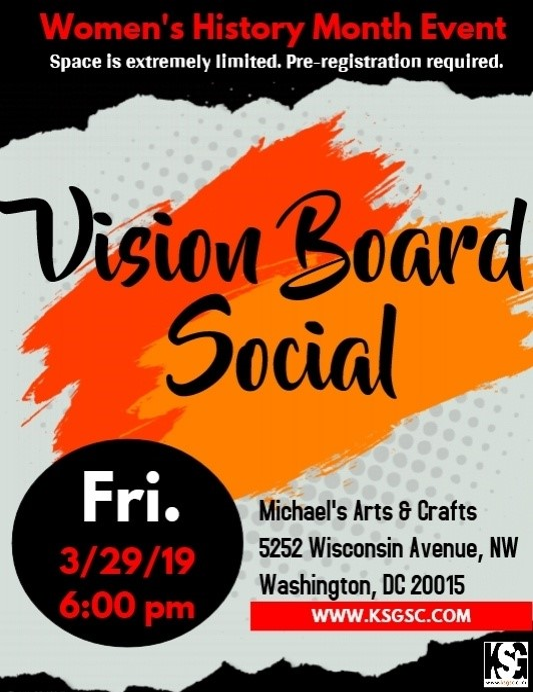 Our Ask The Strategist publisher is sponsoring the Vision Board Social DC, along with Michael’s Arts & Crafts. Note: There are only a few tickets left! Bring your ideas, inspiration and creativity as we define our vision for our professional and personal lives, create the visual manifestation of what we want to achieve in 2019 and beyond, and network with women from the Greater Washington, DC area. While materials will be provided, feel free to bring your own – magazines, books, inspirational quotes – or arrive early to shop with a Michael’s expert, who can help you select finishing touches for your vision board. Let’s #LevelUpYourVision. Space is extremely limited and advanced registration is required. Event registration will remain open until all spaces are filled, or March 27th, whichever occurs first. There is no onsite registration.